● FISH: Cold water seafood like tuna, salmon and mackerel are packed with omega-3 fatty acids that helps prevent against dry eyes. ● GREENS: Spinach, collard greens and kale have an abundance of lutein and zeaxanthin that help to protect vision. This also includes other greens like broccoli and avocados. ● CITRUS & BERRIES: Loaded with vitamin C, these fruits and berries help vision development. ● NUTS: Whatever shelled nut your kids may enjoy, a handful of these are full of omega-3 fatty acids and vitamin E that boosts eye health. ● LEGUMES: Beans, peas and lentils provide plenty of bioflavonoids and zinc that protect the retina. ● BEEF (in moderation): Also contains healthy amounts of zinc and vitamin A that help our bodies to absorb more vitamin A that assists with better vision. Not only will these ingredients protect with healthy eyesight, the vitamins and minerals found in these foods will offer a variety of other benefits for growing, young bodies. Parents and school administrators need to work together in recognizing possible vision problems that can lead to an array of problems when it comes to poor eyesight. While at school, teachers often spot problems with children who can’t see the blackboard clearly, take too long to complete assignments, notice a drop in grades or other signs that vision could be a problem. At the same time, parents need to take notice of other symptoms that could be related to bad eyesight, complaints of headaches, avoiding activities that require good vision like sports and reading. These can all be signs of failing vision that can lead to bigger problems down the road. 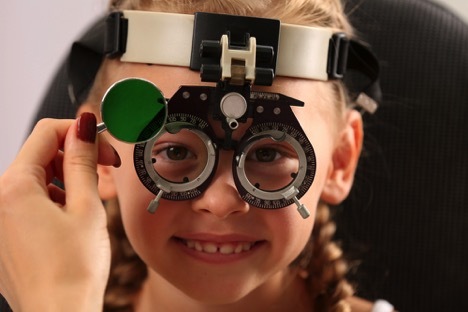 Most of us Mommies know that children receive regular eye exams at school, but those aren’t performed by eye-care specialists, but rather school nurses and other administrators that aren’t trained in the same way as optometrists. These types of tests are pretty basic and don’t evaluate young eyes thoroughly like the way professionals examine things like the retina through a comprehensive examination that involve dilation of the pupil. Doctors who specialize in the development of early eyesight associated with young vision, can spot issues before they become a problem. Seeking the advice of an eyecare specialist should happen shortly after birth, then again before a child enters school and every year thereafter. Being proactive can mean the difference between a possible problem being easily corrected and the loss of vision altogether.